"100" token, awarded by abrahams. R37:446be901ecfe: Added lock free map code and simple bench. R37:82fc40143a78: Added lock free map code and simple bench. Resolved lieroz T8874 Port lock free map into Krita instead of KisTileHashTableTraits. Resolved lieroz T9130 Lock fixing in Krita's tile manager. lieroz mentioned this in R37:e4c03b2f0912: Merge remote-tracking branch 'origin/master' into akamakin/T8628-multithreading…. lieroz mentioned this in R37:985fd222185e: Merge remote-tracking branch 'origin/master' into akamakin/T8628-multithreading…. @lieroz, I've just run into a bug with your implementation. I've reported it as bug 396467, including a video of the issue. Current project state: I guess that project is done by 2/3. I managed to add lock free hash table to fix thread waiting on blocking one, there are still some bugs there that I'm currently trying to fix. That was the first part. Then there were 3 locks in KisTiledDataManager class, they also were fixed and tested. The last one is associated with scheduling jobs, there are 4 hotspots that had to be fixed, I managed to get rid of 2 of them, but last 2 are quite deeply connected with scheduling algorithm. I tried making classes lock free and introduce RW locks, but it was a week of segfauls and errors... There is some work on that, but last 2 spots are really tough, maybe they must be fixed on higher level by introducing new interfaces. 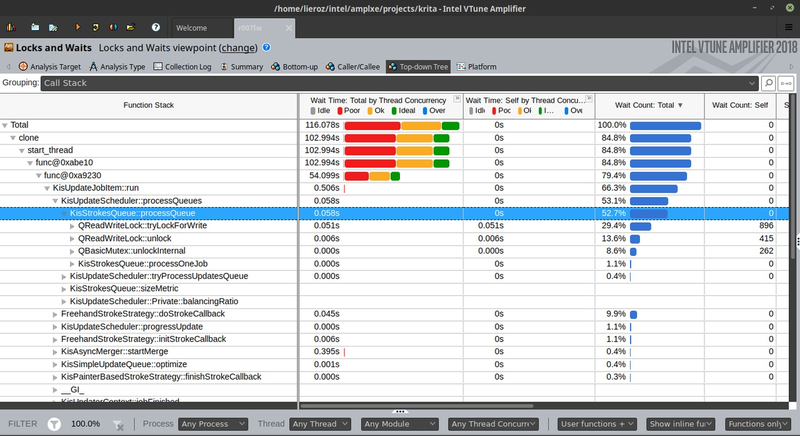 Vtune output with all latest fixes. lieroz closed subtask T9130: Lock fixing in Krita's tile manager. as Resolved.